HOST - No host on premises. 24 hour managers on call. 10% Military Discount w/ I.D. The Austin Street Retreat is an authentic historic home built by European settlers well over a century ago. Restored and embellished through the decades with modern amenities, there are now five unique suites. Located one block off Main Street in Fredericksburg’s National Historic District, this premier property is an authentic Texas treasure built of stone, timber and stucco. It is situated on a large double lot shaded by old growth pecan trees and perennials from the LBJ Ranch. Each suite features elegant, charming decor along with a private terrace. Popular for Hill Country wine tours, family and friend reunions, special occasions and celebrations, the Retreat can sleep a total of twelve people. 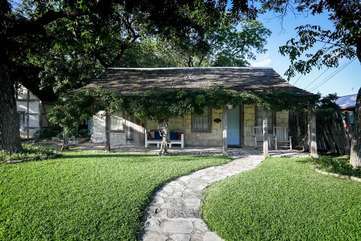 It all began in 1867 when immigrants John and Maria Walter built a log cabin structure and began their new life in Texas. The heritage of these pioneers is preserved here with eighteen inch thick walls, original paint on the ceiling, wood floors and wavy glass in the windows. Added later as the family grew and prospered was a limestone room. Both rooms are now bedrooms each with a Queen size bed. In addition, there is a dressing room, powder room enclosed space with a jetted tub and handheld shower and a sitting room with a flat screen TV, DVD and Time Warner cable. The lovely private terrace has an outdoor table and chairs shaded by a pecan tree which is the perfect place to enjoy your morning coffee or evening wine. Spent a wonderful girls weekend at this charming home! Loved the rustic, cozy, historical feel. Dont let the rustic fool you, it was charming, spacious, clean and all the modern accommodations you look for. We will be back! Wonderful rustic cottage! Loved it!